Transforaminal Lumbar Interbody Fusion, or TLIF, is a spine surgery in which the lumbar spine is approached from the back. The name describes the process: Transforaminal means "through an opening," while lumbar means "lower back" and interbody means "bone graft insterted between two vertebrae." Finally, fusion means "stabilization of the spine." TLIF is an advanced, recent and highly skilled form of spine surgery. 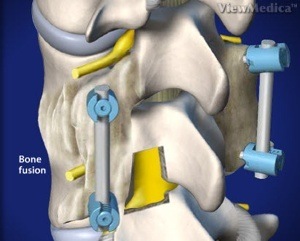 The surgeon stabilizes the spine by fusing the vertebrae together with the bone graft. TLIF is best recommended for patients suffering from spinal stenosis, spondylolisthesis, lumbar canal stenosis, black disc or nerve compression with associated pain in lower back. It is also recommended for people suffering from leg or back pain caused by Degenerative Disc Disease. How Transforaminal Lumbar Interbody Fusion (TLIF) is performed? The surgeon will make one or more small vertical incisions in the back. 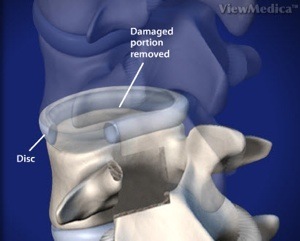 Part of the vertebral bone is then removed to gain access to the damaged disc. In this procedure, the disk is accessed through only one side. Once the disc is accessed, the surgeon will remove the damaged disc. Some of the disc wall is left behind, as it helps to contain the bone graft. A bone graft is placed in the empty disc space. The bone graft material is usually taken from the pelvis, or bone substitute is used. The bone graft realigns the vertebrae and lifts pressure from the nerve roots. The surgeon may decide to fill the empty disc space with morselized bone. If additional support is required, the surgeon may decide to implant a series of screws and rods. Bone graft may also be placed along the sides of spine for providing additional support. The bone graft will grow through and around the implant, forming a connection between the above and below vertebrae. This solid bone bridge is known as fusion. Patients usually have to stay for 3 to 5 days in the hospital after TLIF surgery. For the first few days, intravenous narcotic medication is given to control pain. Blood counts are checked to determine whether a blood transfusion is needed. On the first day after surgery, the patient begins a walking program with the help of a physical therapist. The physical therapist will help the patient learn how to get in and out of bed. The doctor may also suggest a walker and a back brace for walking. The surgical drain is usually removed within two days of the surgery. When the patients are allowed to go home, they are given a prescription for oral narcotic painkillers. Although complications are not very common, there are no guarantees that the spinal fusion will be successful. The risk of nonunion is present, although it is very low. Complications can happen due to blood loss, anesthesia or infection. There is a risk that the tender nerve root maybe damaged during surgery. Medical complications are rare, but they may include blood clots, heart attack and pneumonia.